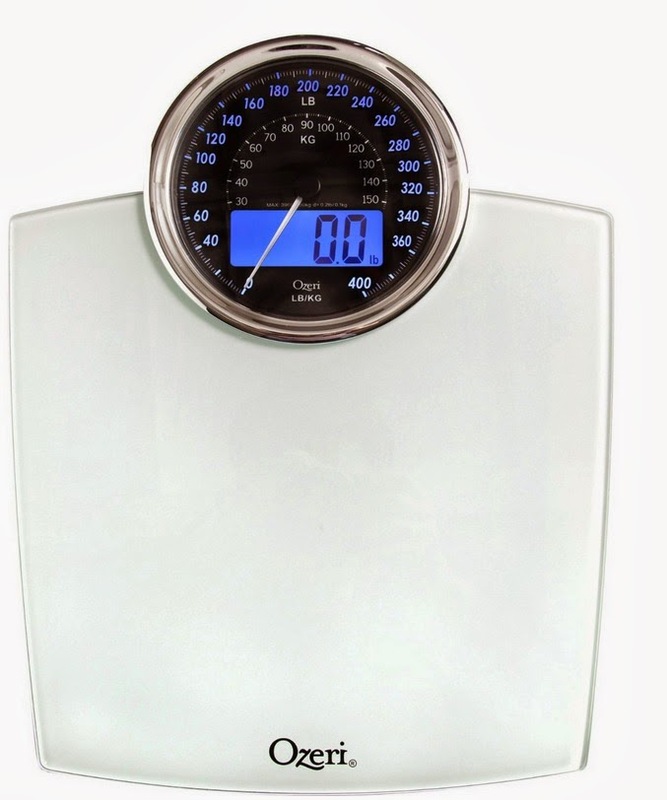 A GAL NEEDS...: The Ozeri Rev Digital LED Bath Scale! Gets Your Most Accurate Weight! The Ozeri Rev Digital LED Bath Scale! Gets Your Most Accurate Weight! 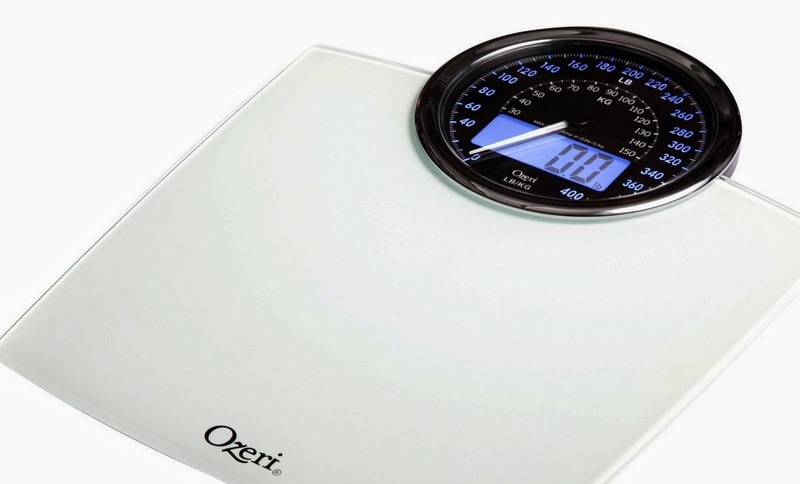 The other day I received an Ozeri RevDigital Bathroom Scale for review purposes. It had a needle like the one on my grandma’s old bathroom scale, where it goes up until it reaches your weight, except this one lights up. I remember the days when the needle would only go up to 105 lbs. Then it went up to 125 lbs. I thought I was so fat. Then it went up to 135 lbs. I thought I was huge. Then it hit 145 lbs. I thought I was a hippopotamus. By then I was using my own digitally read scale. Then it hit 155 lbs. That was a year ago. I was not a happy camper. When I stepped on the new Ozeri Rev Digital Bathroom Scale with the fancy Electro-Mechanical Weight needle as well as a digital reading all lit up, I saw the needle zoom up to 163.4 lbs. Yikes! I want to see less needle zoom and more va-va-voom. So my motivating mental image is that the needle only zooms up to 148 lbs. this summer! That will definitely be a step in the right direction. Isn’t it funny that what someone thinks is fat, is someone else’s skinny? · A synchronized electro-mechanical Dial and LCD automatically illuminate and instantly point to your weight in lbs and kg, for easy-to read results in all light conditions and from any angle. · Visually stunning design incorporates a huge 5.5 inch dial and integrated digital display with stylish chrome accents to create a distinctive retro look with the accuracy of modern technology. · Uses 4 high precision GX sensors that weigh up to 400 lbs (180 kg) in 0.2 lbs or 0.1 kg increments, with StepOn technology that captures precise weight measurements upon contact. · Professional quality scale features and an oversized platform made of impact-resistant tempered glass for ideal stability, and a new built-in alarm that reminds you to measure your weight at the same time each day. · Auto-calibrated and automatically turns off to conserve battery life. Runs on 3 AAA batteries with a Low Battery Indicator (batteries included). Satisfaction guaranteed. I think my favorite features are the 1) LCD lighting that makes it so easy to see anytime, anyplace. 2) I also like how thin and strong it is. The glass is unbelievably strong for looking so dainty and decorative. 3) And the fact that you don’t have to tap it before weighing. Just step on and get your weight reading. True Story: We had 3 missionary friends over for dinner the other day. They have been away from home for various lengths of time. We had put the scale in the kitchen for the time-being and it caught their eye immediately. They loved the way it looked and so naturally they all had to weigh! One of them is from Hawaii and he was very concerned with how much he had gained since leaving home. Apparently in this area, they are well-fed! He got on the scale and we all saw—he weighed 275 pounds. Big boy! The other two got on and we couldn’t believe it. They each weighed the exact same, 215.4 lbs. Go figure. That never happens. It was really fun to see their reactions to our scale! I'm impressed with the company because they were originally marketed exclusively to high-end resorts, hotels and estates! Then through word of mouth, their products trickled down to the consumer. It saves the buyer money because their reputation goes before them through key touch-points throughout the industry so very little advertising is necessary, therefore saving advertising costs which is then passed down to the consumer. The Ozari Rev Digital Bathroom Scale is a great addition to any household and the price is great! I found it for only $29.95 on Amazon! This scale has really cool design! I love how this lights up. I laugh at how I used to think I was overweight 70 pounds ago! I looked good and still hated my body? I love how stylish it looks. That looks like a really cool scale. I love how big the display is.